You will find it at the Tattered Cover Bookstore on Colfax Street in Denver. The building is charming and originally was home to the historic 550 seat Bonfils-Lowenstein theater. You can still see the curtain framing the stage. Two levels host every book imagined. It’s downstairs near the front of this indie bookseller where nine tall bookshelves filled with wonders from the middle grade genre await your eyes. Sticky notes from staff and others align the shelves with their thoughts and recommendations. I had a grand time here today and look forward to attending one of their special events with author talks or signings. 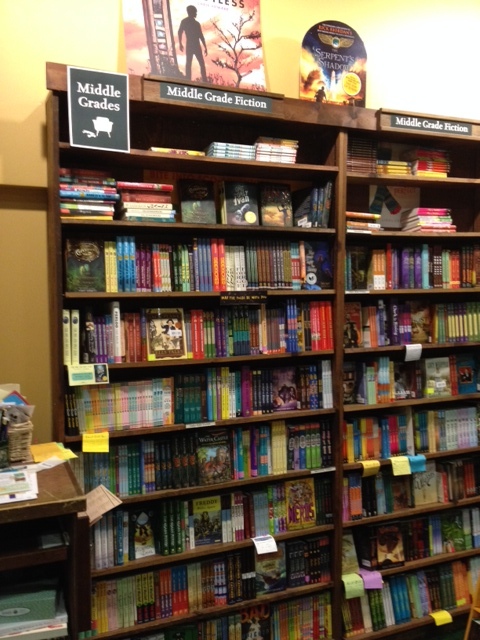 This entry was posted in Reading, Resources and tagged indie book stores, Middle grade, the Tattered Cover Bookstore. Bookmark the permalink. That does look awesome. I love seeing recommendations from staff. That looks like an awesome place! I’m so jealous, I wish I could go!! I’ve got some pretty nice places near me in Salt Lake, though.